Yes, I’ve been a bit absent, but I’ve been distracted and don’t feel one bit guilty about it (okay, maybe just a little). We’re so busy taking care of last minute things to get ready for baby Ruf. I don’t think I’ve cooked a meal in more than a week. Yikes! We’ve been having our ‘last meals’ out with friends, running errands after work, cleaning out the freezer, etc. So this weekend, Andy and I didn’t plan anything except to just take care of things around the house and hang-out with each other. Of course, we ended up doing more than we planned to but it’s been nice. I really didn’t end up cooking much again, but that’s ok. We had a bunch of veggies from our garden and pesto caprese sandwiches. Works for us! It also happened to be my week to host Project Pastry Queen and I chose Bacon and Cheddar Scones. 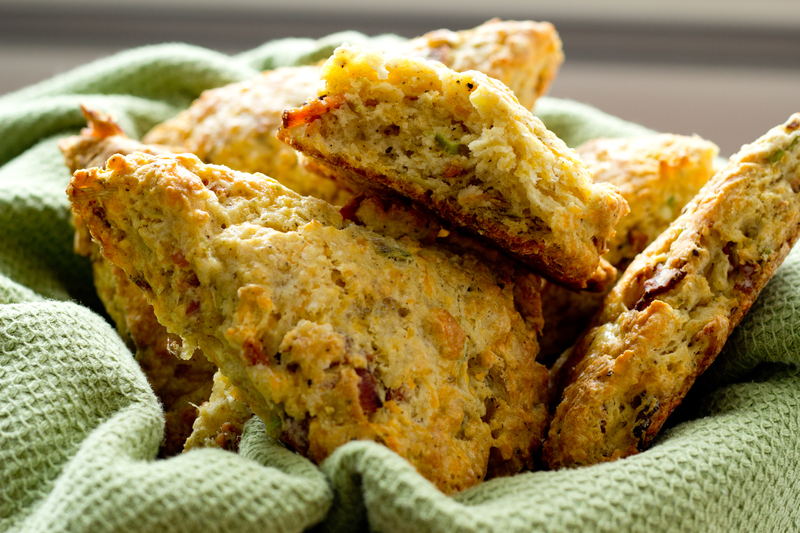 Bacon and cheddar in a scone?!? Yummy! I also made a plain batch for slathering with butter and jelly. In a large bowl, combine flour, baking powder, salt, and pepper. Gradually cut in butter with a pastry blender or two knives until mixture resembles small peas. Add grated cheese and mix until just combined. Add green onions, bacon, and ¾ C of the buttermilk to flour and cheese mixture. Mix by hand until just incorporated. If dough is too dry to hold together, use remaining buttermilk, adding 1 Tbls at a time, until dough is pliable and can be formed into a ball. Remove dough from bowl and place it on a lightly floured surface. Pat dough into a ball. Using a well-floured rolling pin, flatten dough into a circle about 8” wide and ½” thick. Cut dough into 8-10 wedges. Whisk egg and water in a small mixing bowl to combine. 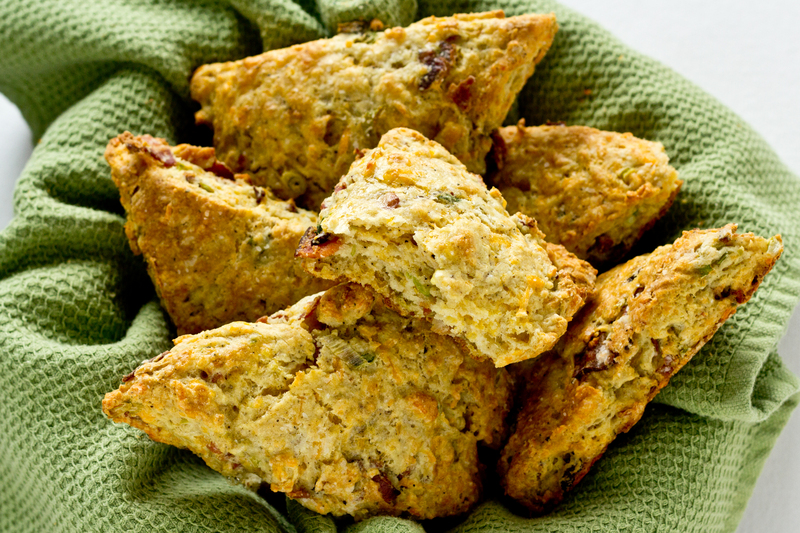 Brush each wedge with egg wash.
Place scones on an ungreased baking sheet and bake for 18-20 min, or until golden brown. Scones can be made in a mixer but for the lightest, fluffiest scones, they are best made by hand and handled as little as possible. Jewelry and brunch. The perfect combination! This past weekend I hosted a jewelry party and tried a few new recipes. All of them turned out great – Creamy Baked Eggs, Cinnamon Sugar Pull-Apart Bread, and Blueberry Scones with Devonshire Cream, Blackberry Butter, and Honey Butter. 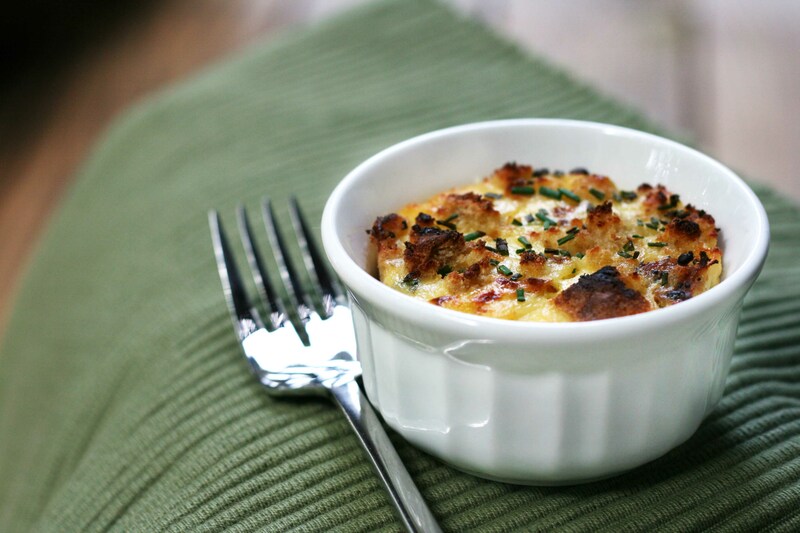 The first recipe I’ll share is Creamy Baked Eggs. I’ll share the rest with you later this week! Promise. Creamy cheesey sauce mixed with eggs and bacon. Tasty by itself or on the side of cinnamon rolls, muffins, scones, or anything sweet. This recipe is a great brunch dish because it can be made the night before. 1. Preheat oven to 350. Grease 6 ramekins and place on cookie sheet. 2. Melt butter in medium saucepan then whisk in the flour until smooth. Cook for two minutes making sure not to brown. 4. Turn off the heat. Add grated cheese and whisk until smooth. 6. In separate, larger pan, cook bacon until brown and crispy. Remove bacon and place on plate with paper towels to soak up the grease. Remove bacon grease from pan, reserving 2 Tbls. 7. Saute green onions in bacon grease until soft. 8. Crumble bacon and add it back to the green onion pan. 9. In medium bowl, beat the eggs. 10. Add eggs to bacon and onion mixture. 11. Cook eggs until they are partially set and add the sauce. 12. Stir eggs and sauce and evenly distribute between greased ramekins. 13. Crumble bread into pieces and sprinkle on top of eggs. 14. If you are making this the night before, cover and put in fridge. 15. Bake uncovered for 2o min or until set and bread is toasted. 16. Sprinkle chives on top of eggs.